This close-up view of Mars from Mars Reconnaissance Orbiter zooms in on Close-up channels connecting ancient depressions, suggesting that lakes once drained into each other about 3 billion years ago, researchers say. 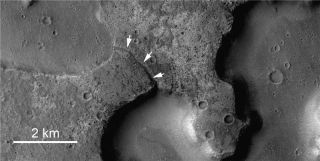 Vast lakesof melted ice existed on Mars more recently than previously thought during awarm, wet spell on the red planet, new images suggest. The lakesmight have been habitats for life, if there ever was life on Mars. So far,however, there is no firm evidence of any Martian biology, past or present. The photographs,taken by NASA?s Mars Reconnaissance Orbiter, reveal a network of windingchannels linking together several depressions in the Martian surface.Researchers say those channels could only have been caused by Martianlake water running between the depressions about 3 billion years ago ?which is 1 billion years more recent than earlier estimates. ?Most ofthe research on Mars has focused on its early history and the recent past,?said researcher Nicholas Warner, who led the study at the Imperial College ofLondon.? ?Excitingly, our study now shows that this middle period in Mars?history was much more dynamic than we previously thought.? The newimages suggest lakes as large as 12 miles (20 km) wide once dotted theequatorial regions of Mars, researchers said. Scientistsalready know that waterice exists today beneath the Martian surface based on data from landers,rovers and Mars images taken from orbit. But past studies have hinted that Marswas warm and wet enough to support liquid lakes around 4 billion years ago. Using theimages captured by the Mars Reconnaissance Orbiter, Warner and his colleaguesconcluded that Mars could have sustained lakes even later, in a period known asthe Hesperian Epoch. ?Scientistshad largely overlooked the Hesperian Epoch as it was thought that Mars was thena frozen wasteland,? Warner said. But Warnerand his team found that during that epoch 3 billion years ago, Marscould have been warmed by volcanic activity, meteorite impacts or even orbitalshifts. The result would be a temporary increase in planetary temperature asthe gases created in those events thickened the Martian atmosphere. Theresearch is detailed in the Jan. 4 issue of the science journal Geology. Scientistsat the University College London also participated in the study. Thechannels revealed by the Mars Reconnaissance Orbiter are the key, researcherssaid. They run between huge depressions in the Martian surface located near a 1,242-mile(2,000 km) gorge called Ares Vallis across the planet?s equator. Scientistspreviously thought the depressions were formed by a process calledsublimation, when ice transitions directly into gas. That process would creategaps as ice sublimates from the Martian surface, leading to a collapse thatwould form the depression. Butsublimation alone would not explain the channels, researchers said. Similarchannels can be seen on Earth in Alaska and Siberia, where permafrost melts tocarve drainage channels that connect different lakes, they added. Warner andhis team are unsure how long the more recent warm, wet period on Mars may havelasted, or how long liquid water could have flowed between the lakes. But theancient lakebeds from the current study could provide attractive targets forfuture probes to seek out regions on Mars that may have once been habitable formicrobial life, they added. Thescientists plan to seek other potential lakebeds in other regions along Mars?equator using more images from the Mars Reconnaissance Orbiter. Launched in2005, the orbiter is NASA?s most powerful spacecraft circling Mars today andhas collected more images of the Martian surface than all other missions to thered planet combined. Video Show:What Went Wrong on Mars?